I’ve got two stories in the running “Beginner’s Luck” and “Sacrifices” – take some time to go and read the stories and vote for your favorite three! Enter the name of your top 3 stories in the spaces provided. To refresh your memory, you can visit any of them by clicking on the story title. Only one set of votes per email address allowed. Email addresses will not be used for any purpose other than to confirm the validity of the vote. At the end of the month, they will be discarded. And this time there are more of them! In April we stepped up from publishing once every three days to every other day, bringing us to 14 authors and 46 stories. You can go here to read the stories and vote. 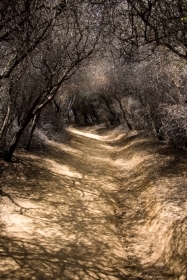 My story “Solitary” was chosen as an Honorable Mention for Necon E-Books January 2014 Flash Fiction contest. WATERLESS wins in the P&E Reader’s Poll! The Preditors & Editors™ Readers’ Poll has been annually honoring print & electronic publications since 1997. 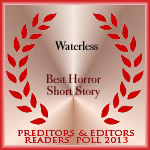 Today is the last day to vote – Waterless has dropped to 2nd place again in the Best Horror Short Story category in the P&E Readers Poll. I’d love it if all my friends and followers could take a few minutes to vote for me. Please follow the link and be sure to follow the FULL voting instructions. Feel free to share this link with others. Thanks so much to all those who have already voted!